Electric coffee grinder is probably one of the loudest devices you can have in the kitchen. Most people usually grind coffee in the morning. Given the fact that the coffee grinder they grind with is usually loud, they have an increased chance of waking other people up while grinding. And this is not the nicest thing to do in the morning. Even if you grind later in the day, the noise can be annoying and there have been many cases with neighbors complaining as well. The noise level when purchasing a new grinder is therefore an important feature to look after. Noisy grinders are not very popular, except if you are okay with noise and live alone somewhere where you cannot disturb anyone. But getting a grinder that is quiet is not so easy. They are electric (at least usually) and have the motor built in. That motor makes noise when it revolves. Noise is the side effect and as long as you have automated grinding, it cannot go entirely away. But it can be reduced. 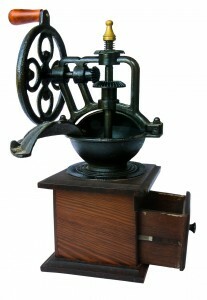 In this article I will talk about burr coffee grinders as they provide better quality. They are also not louder than blade coffee grinders. 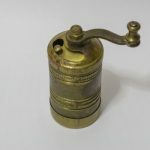 Quietest coffee grinder is manual coffee grinder, but in this article we will review also other kinds of coffee grinders. the burrs. Besides just lowering the decibel levels, it also changes the kind of noise that comes from grinding if you choose slower speed grinding. Many people think that coffee grinder with lower decibel level is better and produces less sound. This is true, but in practice some noises are more annoying to human ear than others. In particular, high decibel low frequencies do not sound as loud as high frequencies at the same decibel level. And slower grinding and turning of the burr does right that. It lowers the noise frequency as well as decibel levels. So looking solely at decibel levels when purchasing a coffee grinder, could be misleading. Besides, it is not always possible to find information about that and not necessarily all measurers have the same way of measuring. Consumer reviews might give you more guidance as well as information about the motor and exterior of coffee grinder. Motor is one of the most important parts of a coffee grinder. Motors have a lot to do with loudness of the grinder as well as with static and heat production. Different motors turn at different speed. Motors with high revolving speed are not the most desirable feature in a coffee grinder. They make the burrs rotate very fast. This is a problem because than beans in between the burrs are grinded very fast and this creates a heat buildup. It also creates static problems. In terms of noise, fast revolving motor creates more noise as if it would turn slower. High speed motor direct drive grinders are grinders which have motor attached directly to the burr. 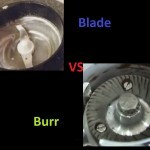 Burr rotates fast and produces a lot of heat and static. Those are usually cheaper models. This produces a lot of noise. High speed motor with gear reduction. They have also high speed motor which is then attached to gears which reduce turning speed. They are then connected to the burr. Result is slower turning speed of the burr and therefore less heat and static. 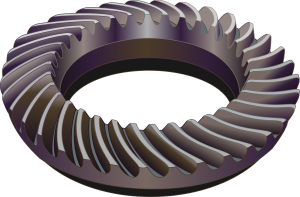 Because of gear reduction, the burr moves slower and produces less noise, but is still far from perfect. 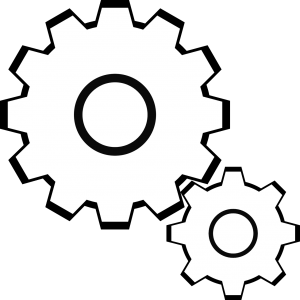 Models with gear reduction are usually more expensive than those without it. Low speed motor. Those are the best for all, reducing the heat and static as well as minimizing the noise of the grinder. Motor is attached directly to the burr, but is rotating at slower speed. It still needs power, so grinders with such motors are not cheap. You can find them only in more expensive models. Another thing that affects the loudness of the grinder is its exterior. This is when noise has already been created by burr and motor. Exterior of the grinder reduces the noise, but only to some extent. How big the reduction is, depends on what exterior there is. Plastic is the cheapest one. As you might expect, plastic does not reduce noise considerably. There are some other exterior constructions, perhaps most used for noise reduction (and usually more for protection from outside damage) is stainless steel. That reduces noise a little more. Manual coffee grinders are the grinders which do not have a motor. There you grind coffee beans manually, on hand. This will in turn assure you with much less noise. Moreover, loudness is usually not a problem for manual coffee grinders. But many people do not like grinding by hand because it takes few minutes to grind a fine espresso, instead of few seconds as it would take with electric grinder. Also it requires a lot of work – it is labor intensive. To grind on hand for few minutes as the first thing in the morning is certainly not the best feeling. But they are usually cheaper, portable and reliable. Some of them can therefore be a good choice if you want a quiet coffee grinder. Tricks described below will work on some grinders but not on all of them. Make sure you check how the grinder is connected to the surface. A lot of noise can occur with grinder vibrating at the surface that it’s on. The solution to that could be to just place a towel or something similar underneath the coffee grinder in order to reduce vibration and noise. If possible decrease the grinding speed. Some grinders have an option to do this, many do not. Place a little foam padding where it meets the countertop. Those methods might not be the best and they are a quick-fix solutions, but they might still help you reducing the noise a bit. They might help if the noise that your grinder produces is unbearable and you just have to do something about it. Or they might be exercised as an additional measure to decrease the coffee grinder noise. What is the best quiet grinder? The most silent coffee grinder is hand coffee grinder, but that is notnecessarily the best. But most of the people prefer electrical ones. Below are described some quiet coffee grinders you can find on the market. Porlex Mini is manual coffee grinder. A grinder is equipped with ceramic conical burrs which can grind a wide grinding range. It produces consistent grind. Some hand grinders have problem with producing a consistent grind at very coarse setting. This grinder has similar problem, but with good cleaning and some experience (after you have it for a while), it is possible to achieve a consistent grind even at very coarse setting. The burrs are also easy to clean. The capacity of the grinder is 25 grams which is enough for a double shot. The grinder is made of stainless steel and produces little static. The design is appealing – it is small and great to carry for trips on camp or similar adventures. About loudness: it is one of the quietest coffee grinders on market. You will enjoy quiet grind and will not wake up your friends or family when grinding. If you do not like its smallness, you can also buy a tall version of this grinder. 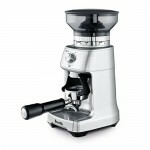 At full capacity, the tall grinder will grind 4 tablespoons of espresso ground coffee. 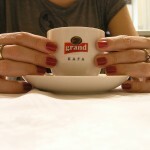 Of course speed of grind is the problem for both models – you might need few minutes (2 or 3) for a double espresso shot. The time you need depends on beans you are grinding and your own speed of grind and on grind setting (fine will grind longer than coarse). The price of this grinder is around 45$ for mini and 5-10$ less for tall version. Mini is more portable. Low price and quietness are certainly desired factors at this grinder. Hario Skerton is also manual coffee grinder. Grinder is equipped with conical ceramic burrs which are durable and easy to clean and to be maintained. Grind settings are easily adjustable and they produce consistent grind. There is a problem with very coarse grind which is not very consistent. But if you are not very picky about that it should be good enough. The grinder can hold 100 grams of ground coffee which is enough for several shots. Its design is small and therefore it is great to carry around. Another great feature of the grinder is that it is very durable – especially the burrs are made to last for a long time. It is one of the most used hand coffee grinders. A time required to grind is similar than for Porlex – if you grind very fine it can take a very long time. Grinder is fairly silent. Loudness depends on how fast you grind but it is a little louder than hand grinding pepper. If you put it in between the legs, it becomes even quieter so it can be a good solution against noise! Capresso Infinity is marketed as the most silent grinder on the market. It is an electric grinder and it comes in two versions. Capresso Infinity 560 is made of plastic exterior and costs around 100$. Capresso Infinity 565is made of stainless steel exterior. The latter is around 50$ more expensive, but it creates less noise. It has conical burrs inside and gearbox reduction motor which also assures that there is little heating and almost no static. Although it is equipped with gear reduction, it will still grind very fast in comparison to hand coffee grinders. The grind it produces is consistent and it has 16 steps of adjustments. Moreover, it is also equipped with a timer, which proves to be useful feature. The loudness of the grinder is low. It is at about 70 decibels, but the noise that the grinder produces is not very irritating. It is possible to maintain normal conversation while the grinder is running. This holds for 565 model. Model 560 is a little noisier, but not much. You can still maintain conversation while grinding coffee. So 565 will give you better noise reduction, but even 560 already makes less noise than most of the grinders. Another great feature of this grinder is the price. It is very cheap – around 90$. Certainly worth the money if you are considering a quiet coffee grinder! Among the grinders that were reviewed on coffee grinder world, Breville smart grinder Pro is also relatively quiet. It is the quietest of all Breville coffee grinders on a market and also has quite a good quality. The grinder is equipped with stainless steel conical burrs which are easy to clean and offer a very consistent grind wide variety of grind settings. With 60 steps of adjustments, you can adjust the grind of your taste. It has a large bean hopper capacity – 1 pound and a useful timer. Housing material is stainless steel with plastic which also reduces noise considerably. It has also other desirable features with which the brand is making its way to the worldwide coffee grinder market. The noise level comes to around 75 decibels. That will interrupt your conversation but is still quieter than majority of coffee grinders. Price of the grinder is around 230$ which classifies the grinder in mid-range grinders. This grinder is best for home use. This is one of the more expensive coffee grinders. Although it is very expensive, the noise reduction is there, but Capresso Infinity might still be quieter. It has a direct drive motor that rotates at around 1600 RPM – quite fast for a grinder. But on the other hand it grinds coffee beans very fast. The grinder will provide you with one of the best grind quality you can find on a market of coffee grinders. Durability, consistency and stepless adjustment are all good things about this grinder. It is equipped with stainless steel 58mm flat burrs. 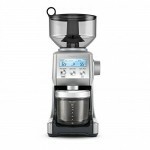 The grinder has large bean hopper (20.8 oz), a doser and timer. 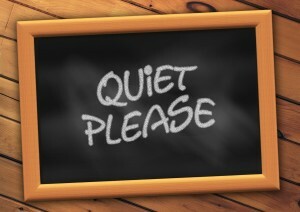 In terms of quietness, its decibel rating during grinding is around 75 decibels, which is not the quietest. However it is quieter than most of the grinders on the market and comparable with other grinders in this price range. I make your choice of buying a grinder easier!